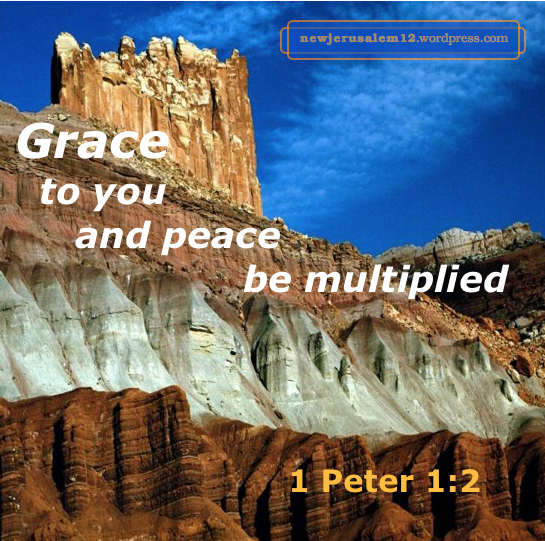 1 Peter 5:10: The God of all grace, has called you into His eternal glory. 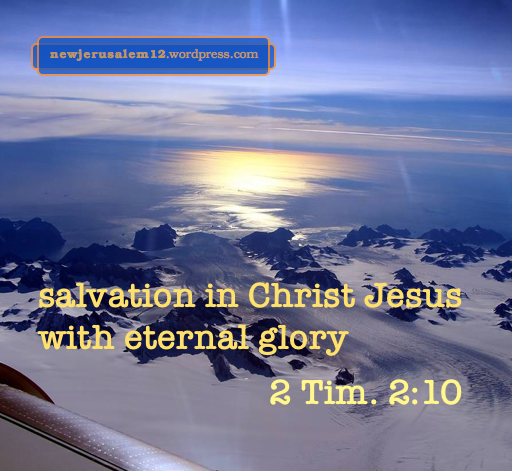 The eternal New Jerusalem is the consummation of the eternal God’s eternal purpose, accomplished by eternal redemption as part of an eternal salvation of eternal life in an eternal covenant to bring forth an eternal weight of glory. First Peter 5:10 tells us that “the God of all grace, He who has called you into His eternal glory in Christ Jesus, after you have suffered a little while, will Himself perfect, establish, strengthen, and ground you.” God has called us to participate in His glory! The fullness of this participation is New Jerusalem. For this God is working in and on us in four ways. Whether or not we can differentiate between perfecting, establishing, strengthening, and grounding is not of highest importance. God knows what is in each category and He is bringing all four to completion. We who have been called into the eternal glory “receive the promise of the eternal inheritance” (Heb. 9:15). This inheritance includes the Christ we have received and experience now and the greater appreciation and experiences of Him in New Jerusalem. Second Peter 1 begins with the our having received “all things related to life and godliness” and “precious and exceedingly great promises” (v. 3-4). By diligently cooperating with these gifts, we develop in Christian life (v. 5-10). Through this “the entrance into the eternal kingdom of our Lord and Savior Jesus Christ will be richly and bountifully supplied” (v. 11). 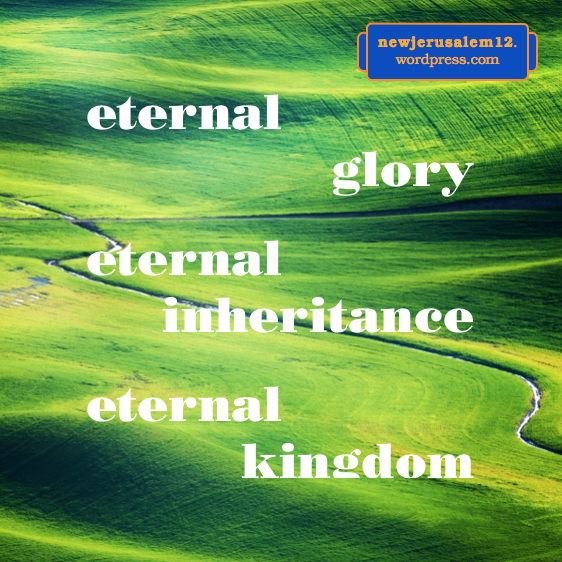 This eternal kingdom includes both the coming age and New Jerusalem. Photo by Jesse Zheng via pexels.com. Both the kingdom and the glory are God’s but He has called us to participate in them. The first half of 1 Thessalonians 2:12, exhorting us to walk worthy of God, indicates that our participation is present and experiential. This present partici-pation is our foretaste of New Jerusalem. The guidance and energizing for this walk is 1) the conduct of the apostle among the Thessalonians (1 Thes. 2:1-10) and 2) his exhorting, consoling, and testifying (v. 11), plus 3) their receiving his word “not as the word of men but even as it truly is, the word of God, which also operates in you who believe” (v. 13). Because the word of God, transmitted to us by the Spirit through the Bible, is living, we need to let it dwell, live, spread, and operate in us. Lord, cause Your word to live and operate in me! This operation gradually develops the character and walk of New Jerusalem in us. Unlike the early Thessalonians, we do not have the pattern of the apostle Paul. However, we are among Christians, and the Lord is not limited by the absence of Paul. We should ask the Lord to show us one or a few whom we can consider and let their Christian walk be a pattern to us. Lord, besides Your operating word, show me how to have a worthy walk on my way to New Jerusalem. Suffering in our Christian life, which is normal but temporary, brings forth glory in stages from now to New Jerusalem. We continue with Peter’s speaking about this. First Peter 5:10 speaks of “the God of all grace, He who has called you into His eternal glory in Christ Jesus, after you have suffered a little while, will Himself perfect, establish, strengthen, and ground you.” We thank this wonderful God that we have been called into His eternal glory! Acts 11:23, Barnabas arrived and “saw the grace of God” in the believers in Antioch. First Peter 5:10 concludes that God “will Himself perfect, establish, strengthen, and ground you.” The result of all this divine work in us is “to Him be the glory and the might forever and ever” (v. 11). 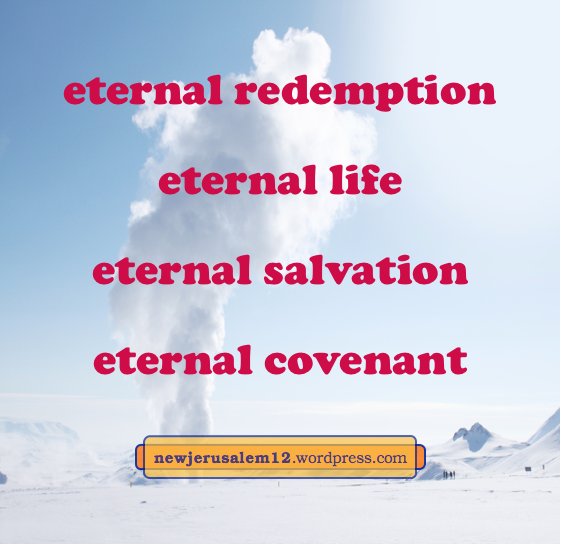 Forever points to New Jerusalem, full of glory and might to God. While the eternal life grows in us and perfects us for New Jerusalem, we also have outward sufferings. 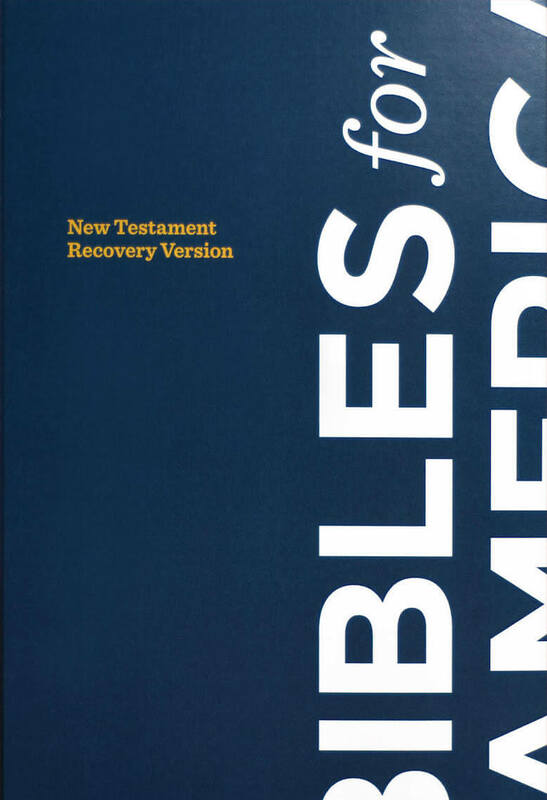 Second Corinthians 4:17 tells us that “our momentary lightness of affliction works out for us, more and more surpassingly, an eternal weight of glory.” Our afflictions remind us how much we need the Lord. Sufferings remind us that “should not base our confidence on ourselves but on God, who raises the dead.” The afflictions push us to the Lord, and as He spreads within us, the “eternal weight of glory,” a strong characteristic of New Jerusalem, is developing within us. With this eternal and glorious view, our attitude about sufferings matches 2 Corinthians 4. “We do not regard the things which are seen but the things which are not seen; for the things which are seen are temporary, but the things which are not seen are eternal” (v. 18). Lord, turn our eyes and thoughts from what is seen to what is unseen! Romans 5:2 says that we “boast because of the hope of the glory of God.” This hope is not our determination but is “Christ in us, the hope of glory” (Col. 1:27). This includes the Lord’s visible return as “He comes to be glorified in His saints” (2 Thes. 1:10) and culminates in the glory of New Jerusalem. (v. 3-11). This view matches what is in 2 Corinthians 4. We cannot endure the sufferings/afflictions/tribulations on our own. But Christ is in us! He endured the cross, despising the shame. He is very real, although presently unseen physically. He is our hope of glory, and He will be our glory in the coming age and in New Jerusalem. In New Jerusalem we will see the face of God and the Lamb (Rev. 22:4). Now, in resurrection, we see the Lord in spirit and He is our joy. The prior posts touched John 14 and 16. Then the Lord prayed, “I desire that they also may be with Me where I am, that they may behold My glory.” (17:24). To behold His glory is to behold Him, to have a foretaste of the promise in Revelation 22. This mutual indwelling is in spirit. The Spirit of reality has regenerated our human spirit (John 3:6) and now indwells it (John 14:17, Rom. 8:11). We are one spirit with Him (1 Cor. 6:17). In spirit we see the Lord! It is wonderful to await the Lord’s second coming when “every eye will see Him” (Rev. 1:7), and to pray Amen, Lord, come quickly (Rev. 22:20). Yet, while doing this, we must not forget that today we are in Him and He is in us so we can behold Him and His glory now. New Jerusalem will be the fullness of beholding the Lord and His glory, but this is available in lesser degree now. Lord, grant us this beholding experience today! * Part of footnote 1 on John 17:24 in the Recovery Version Bible, © 2017 by Living Stream Ministry. 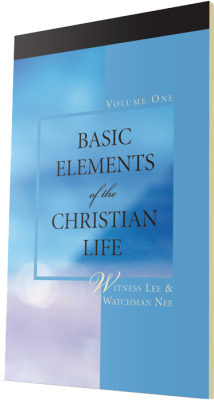 We received the Christian life, the divine life, the life of New Jerusalem, at our regeneration. Now we pursue growth in this life that we may reach God’s goal for us. On one hand, God will bring us to this goal. 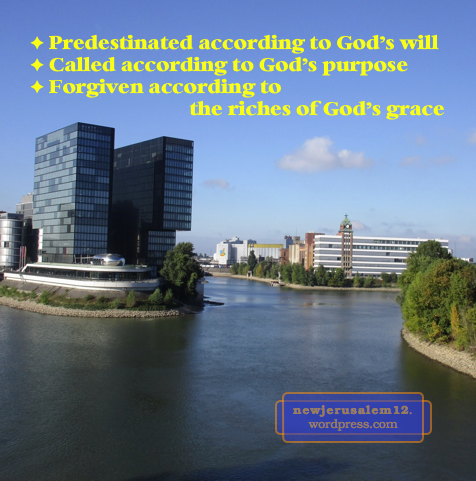 On the other hand, there is need of our pursuing and our laboring in prayer (prior 3 posts). His doing in us is based on the Lord’s blood shed in His redeeming death. The goal of His doing is eternal glory to Him through New Jerusalem. Hebrews 12:1-2 is on the side that we need to cooperate. 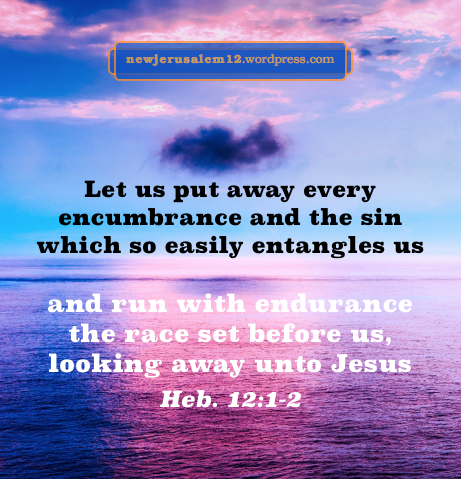 “Let us…put away every encumbrance and the sin which so easily entangles us and run with endurance the race which is set before us, looking away unto Jesus, the Author and Perfecter of our faith…” We follow the example of the Old Testament people of faith, described in Hebrews 11, to put away all hindrances and run the race before us. Are we able to do this? Not in ourselves! But we “look away unto Jesus!” He attracts us and empowers us to overcome all the distractions and run toward Him with New Jerusalem as the ultimate goal. While we are looking to Him, He perfects our faith, just as He has already authored (initiated) it. Praise Him! Lord, keep me looking away to You! 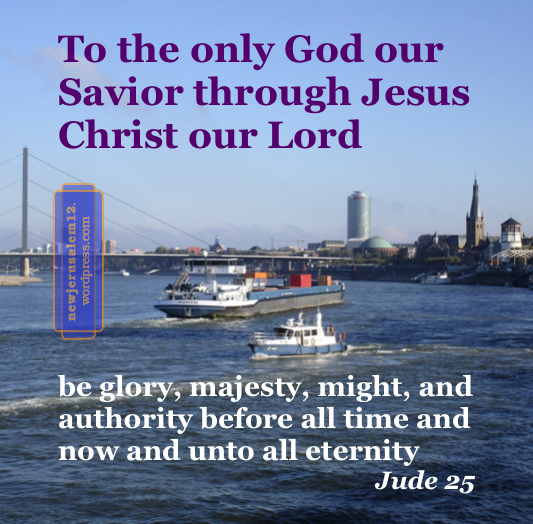 Jude 25, ” To the only God our Savior through Jesus Christ our Lord be glory, majesty, might, and authority before all time and now and unto all eternity. Amen.” Because this verse includes “unto all eternity” it is speaking about New Jerusalem. God our Savior and Jesus Christ our Lord, who is the Lamb of God, will be on the throne in New Jerusalem (Rev. 22:1, 3). Because God through Jesus Christ is our Savior, we will share New Jerusalem with Him. Whether we understand these four characteristics or not, we know from Jude that God wants them expressed and we should be assured that the development of this expression is “through Jesus Christ.” We can pray simply, Lord, develop these characteristics in me and in the Christians around me. 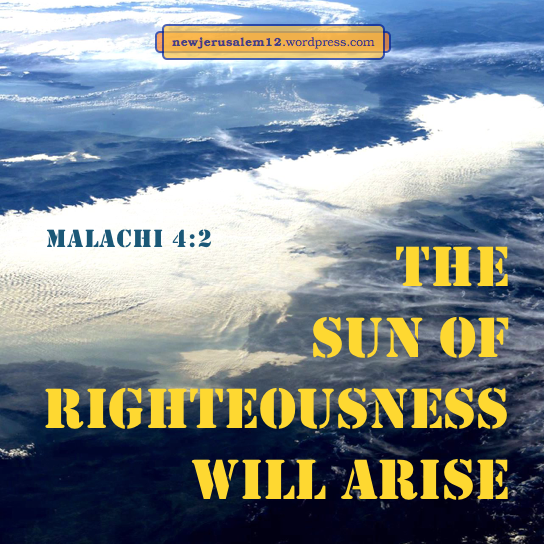 Since “glory, majesty, might, and authority” will be to God in eternity, they certainly will be to God in New Jerusalem and in the whole new creation.